The number of homes for sale in Lamorinda has dropped almost 30% at the end of August over last year at this time. Following this direction, the number of buyers going into contract on single family homes and the number of sold homes is also down 14% and 13.6% respectively, with the sold price dropping an additional 9.5% over last year in August. This is probably an indication of the lack of urgency on the part of the buyers, even though the rates are still at an all time low for loans. The average price per square foot has dropped 4% as well for all single family homes in Lamorinda. The statistics for August 2011 were better in all categories over the same time last year except the number of homes on the market for the Danville/Alamo areas. While the active listings were down 21.3%, the average sale price was up 14.2% over August 2010, number of closings up 15.3% and the average price per square foot went up 4.3%, all very positive indicators. 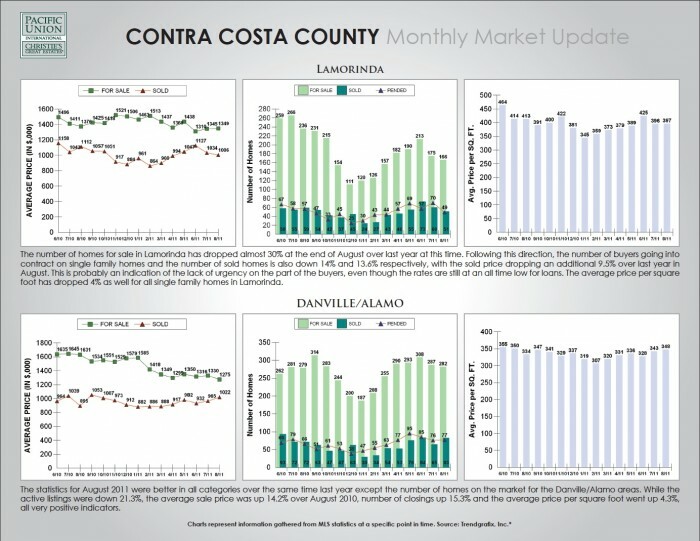 If you are currently looking to buy or sell a home in Contra Costa, click the image below to view our Contra Costa County Monthly Market Update. Visit our site for up-to-date information on Contra Costa real estate market conditions.